Composting Tips - Hawthorn Nurseries | Hawthorn Nurseries & Landscaping ltd. Tips for your organic vegetable garden by Dermot O’Mara. Composting is probably the most important procedure in any garden. We are all party to our national waste crisis. 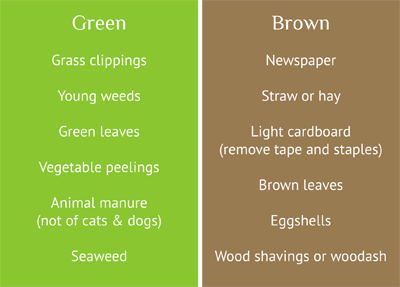 There is so much household and garden waste that can be broken down into rich, valuable soil. This compost can then be used to enrich lawns, trees, shrubs, fruits and vegetables. Waste is not a problem but an opportunity for gardeners. Composting is a natural process and if you follow some simple steps you too can have an enhanced compost-fed garden. As you will be adding a lot of household waste it is important to locate your compost station close to home. An area that gets plenty of sun is important as heat is essential to the process. Do not put your compost on concrete or paving. Regular soil is best as the worms will have easier access and adequate drainage is necessary. In recent years plastic composters have become available from local councils and garden centres. These can work well if you are willing to give them much attention. They are often too small for serious gardeners. Sometimes it is more fun to construct your own. In the spirit of recycling all you have to do is look around for suitable materials. Pallets, blocks or landscape timbers all work well. Build a four-sided square box. If you decide on a four-sided model then allow one side to be removable and accessible. It is important to have a roof also. This can be of black plastic, galvanized metal or carpet. Never add meat, fish or cooked food to your compost. Rats and mice will surely take up residence if you do. It is not a good idea to add manure from carnivore eating animals. Don’t ever add chemically treated plant materials. Avoid glossy magazines and plastic materials. Never add perennial weeds to your compost; docks and dandelions should have there own “toxic” pile at the bottom of the garden. Adding weeds of any kind that have gone to seed is not advisable. Coal or peat ash is best put on pathways and is not recommended for composting. Composting is a natural process and takes time. Don’t let your compost get too dry or very wet. If you can fork it over every so often it will speed up the process. Full compost will be dark in colour and crumbly to touch. This stuff is magic and can be used to invigorate any plants in your garden. It is never too late to start a compost station and the rewards are blooming great!